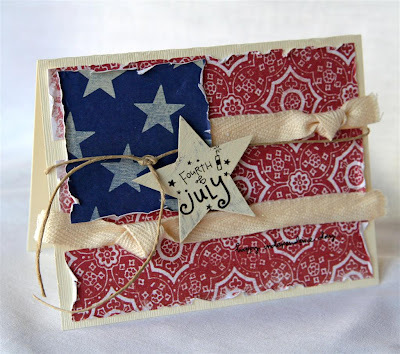 Label Tulip Blog: Day 4 - 4th of July giveaway! 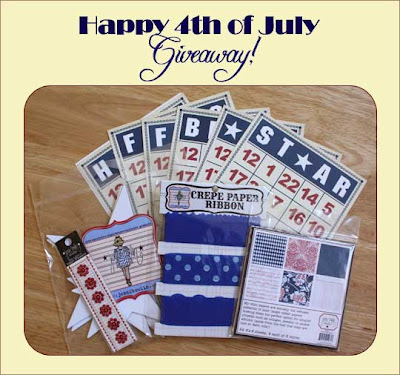 Day 4 - 4th of July giveaway! Today I have a couple of flag cards to show you. The first one was created very easily and quickly by first cutting a piece of the red background paper to fit the card, a square of blue paper for the corner and 2 ribbons tied in knots for the white stripes on the flag. I painted a chipboard star and added a rub on over the top when dry. (Supplies are all by Melissa Frances.) Quick and easy! The second card was made with more of a bright, fun style. I took a large piece of the circle cardstock and laid it over the card base upside down and sprayed with Graphite Glimmer Mist. After dry, I cut two rows of the circle cardstock (red side on the front) and used those as the red stripes on the flag! Then I just stitched little waves over the stripes. (The inside says, "...to be free! Happy 4th of July!") If you are afraid of where to stitch on the card, draw it out first lightly with a pencil and stitch over your pencil lines. Then erase the pencil lines when you are finished. Supplies are mostly Scenic Route's Garden Grove line. Love how you offset the red circles for your stripes! If I was free to do anything today I would... well....travel to Washington DC to see one of the best fireworks displays! I love the first card...so effective yet simple especially if you were to be making quite a few for family and firends.....If I were free today I'd fly non stop around the world and visit all my family in USA, Australia and NZ! I'd say someone: I Love You! If I were free today, I'd say someone: I Love You! love the cards. hmmm, if i were free to do anything today, i'd spend a nice, mosquito-free evening with clear skies and an awesome fireworks display with my family. If I was free to do anything today, I would bring all of my family together to the lake for a wonderful holiday celebration. Thanks for the chance to win those yummy goodies. If I had today free, I would love for my whole family to be with me this minute! Love the cards, Dani. The first one is my favorite!!!! Great designs, Danielle! If I were free to do anything today, I'd def. take a nap! I wish I were spending the day at the beach with my family, enjoying a BBQ and watching the fireworks over the ocean! If I had the chance I would go to Washington DC today to visit the Statue of Liberty and watch the fireworks display. What a wonderful flag papercraft you created. If I were free today, I would spend the day making more to send to Cards for Heroes. I would wish to be a the beach on vacation with my Family...ahhh do you hear the waves? Both cards are so beautiful!!! a humongous party for the day!!!!! Love that flag card!!! I doing exactally what I would want to do today.. I'm working on a commission in my art space....the happiest place on earth! If I was free today I would go out with my family to dinner in a nice restaurant. I am a first generation American-so the freedoms and opportunities of our country are very important to me. If I could do anything today, I would visit my father's grave. He fought in WWI and is buried in upstate New York. I have never been able to visit him. The freedom to do nothing is good enough for me...thanks to those that fight for that. If I was free today I would love to go to NY to see the firework display. If I were free to do anything today, instead of cleaning house I would DEFINITELY be scrapping instead! Wow - great cards - very clever and very quick - love that. If I were free to do anything today - I think I would take my nephew to Toys R Us for a shopping spree - then photo like mad so I could scrap the pics!! Absolutely fabulous cards! If I were free to do anything today... I would wish for sunshine and have a cookout and firework with all of my children. Scrapbook to my hearts content! You are truly an inspiration! Love your cards - especially the first one!! I I could do anything today I would do exactly what I am doing - - spending time with my daughter and husband. . .glad I am FREE to do whatever it is I wish. love your designs and product. i would spend time with the love of my life and my family enjoying the beautiful weather and creating memories for a lifetime. hope you have a safe and happy fourth of july!! (I doubt Canadians can play along on this one) but as far as what I would do I would hug my nieces and nephews and tell them how much I love them...then we'd all eat ice cream ! Happy Fourth of July! If I were free to do anything other than celebrating my youngest son's birthday and my countries Independence Day.....nah! I wouldn't rather be anywhere but right where I am! I love your great designs! Well, if I were free to do anything today, I would stay at home and watch the TV to find the updated US news. If I were free to do anything today, I would spend time with my family and go see the fireworks in Atlanta. if i was free to do anything today, i would want to visit an old friend in the army that i miss. 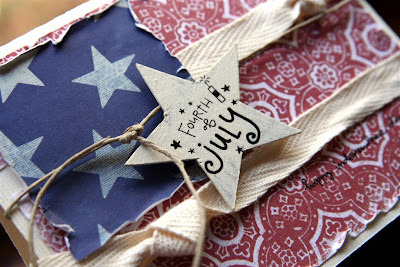 If I were free to do anything today I would sleep til noon, blog hop til 6:30pm and watch fireworks from the roof. Exactly what I'm doing because I AM free. I'm free to live in a country that continually pays the price for me to be free. Freedom isn't free. I'm thankful that there are men and women who sacrifice daily for me to be free. I'm thankful that I SERVE A MIGHTY GOD that sacrificed his Son so I could be free. if i was free to do what i wanted i'd have a photo shoot with my hubby. If I were free today I would clean my basement so I could finally have an area to scrapbook! Great cards... I would love to go to the beach somewhere warm (it's windy and cool here today) and just lay there with a good book!!! I'd love to be free from my chores for the day! :) Thanks for the chance to win! I am free today, but the one thing I would love to do is spend time with my dad who passed away two months ago. So I will spend time with memories of him and how much I love him. I wish everyone a Happy Forth of July, and tell the people you love how much you love them and how great it is to be free. If I were free to do anything today I would spend that last hour with my mother to tell her how much I loved, appreciated, admired and respected her. Love your cards so cute! If I were free to do anything today I would go shopping by myself. I need a break can you tell. OMG,stunning hun! 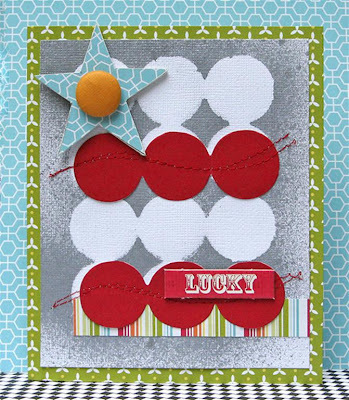 If I am free I would really love to try the scraplift challenge and do some scrapping today. I would have been off from work and lounging in the pool! I would not have had to work all day and would have been free to spend the whole day cooking out and spending time with my sweet husband and dear daughter who came home from college, last minute. If I were free to do anything...it would be to live worry free every day. great cards there! i love especially the 1st one. thanks for sharing with us! I would go to NYC and watch the fireworks with my husband and 16 month old baby. Remembering how absolutely lucky I am to even have the opportunity to do so. Love these ideas...If I were free today, I'd head out to Philly to watch fireworks, or head to Disney for their show...plus eat a ton of corn on the cob and fresh watermelon! If I were free to do anything today, it would be to watch fireworks at the beach! I had a great day of no rain with my family and friends and if I was free to do anything I would also have time to scrap! Those cards are great and I wish I had made one for the hostess of the cookout that we attended. If I could spend today any way that I wanted, then I'd spend it just as I did--with my family at the lake. We swam, we ate, we relaxed, and then watched some fireworks out over the lake. It was a wonderful day, and I'd choose to do it all over again any time! omgosh that giveaway is awesome! and the card is adorable, great design! well, it rained here most of the day, so i would have loved to have a bbq with friends. a traditional 4th! I'd relax. read a book. I'd go to the USa and enjoy th 4th July. I always love your work! If I was free to do anything...it would be to garden; rarely have the time anymore! Just the same as I do every year. Spend it with my Fun extended family! very beautiful cards! i love the distressed look. if i were free to do anything today, i'd go to chicago and celebrate the 4th in style! If I were free today..... Mmmmmm I think I'd spend time with my MIL as it's her birthday. If I were free to to anything I would love to come visit you for the 4th and be able to study both the fenomena of celebrating the 4th and as an extra plus more of your work! Since I live in Sweden it would be a bit to travel but I would love every second! Loving those cards and the techniques!! And I love LOVE LOVE JENNI BOWLING! Wow such adorable cards!!! Your giving me some great ideas!!! If I were free to do anything today, I would take my niece to the park and take a ton of pictures for her scrapbook, then later go swimming in the pool and cool off. I love the cards! So festive and cool! If I were free to do anything today, I'd get a kitchen makeover of my dreams and have all of my home improvement projects done and paid for. Your cards always blow me away! Gorgeous! Thanks for all the inspiration! thanks for the title ideas! that is a super cute giveaway! thanks so much!! if i were free to do anything today( the fourth) i would spend it all with my family and friends..oh wait i am! perfect. YESTERDAY I did exactly what I would have done-had a get together with family and friends! We had a blast! We are in a new neighborhood-and BOY were there fireworks!!! Today-hmmm... I would probably scrap then nap! :) But alas, I have to volunteer then MAYBE scrap a bit. Thanks for giveaway! Fingers and toes crossed! If I were free to do anything today, it would be to spend it with my friends in AZ. I love your cards. I should do more of those! Lovely cards! If I were free to do anything today, I would finish scrapping my babies 1st year album! beautiful cards! Love that you gave tips for titles! if i was free today, I would go for a walk in the mountains. I am free today thanks to this great country. I am spending the day with my family enjoying each other. Love the twill as stripes idea. these are so beautiful! I love your take on different stripe methods!! I would go to an MLB Angels game with my All Star boys. . .
Be a stay at home mom! Exactly what I've been doing...man, I love this country! Both great designs. Love the diversity! 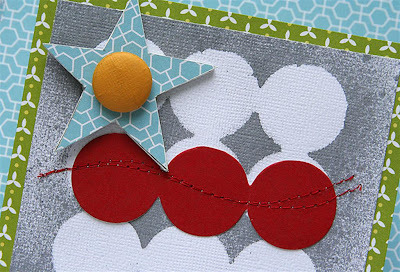 love both cards - especially the one with ribbon stripes. If I could do anything today...I would sit in the sun and read scrapbook magazines all day! Spend the day with my fam of course. But if they weren't around I'd sleep in and then scrapbook all day, take a nap and then scrap some more! What a great prize pack. If I was free to do what I wanted I would walk up to heaven and get my mom and spend the whole day with her watching fireworks. Of course I would be scrapping! If I were free to do ANYTHING today...it would be to be with my mother and father on the 4th of July...I have such fond memories of our little "celebrations" ... my father would always make it a big deal for us ...and mom would always allow us to "stay up late" to see fireworks...and cook on our little grill! Such happy times! Gorgeous cards! If I were free to do anything it would be to travel to Europe! great giveaway! if i could have done anything today i would have scrapped my heart out. My day I plan to rest, since I have worked very hard this week. I hope to get a little scrapbooking done. I'd love to have a guilt-free day to make cards or scrapbook! Alas, there's always other things needing to be done! travel to go to my parents house !!! thanks for the chance !!! Love the cards!!!! Scrapped all w-end! Love the cards,the non-traditional card is awesome. It's great to do differnent things. With life always being so hectic i think i would take the whole day for myself and make cards all day! !And then have a big dinner w/friends & family to celebrate the ending of the day! Beautiful cards. If I were free to do anything today I would pack up the family and spend it in Washington DC. I have never been and would love to be there on the 4th of July. Sooo cute! If I were free to do anything...I would pick going to the beach with the family and watch my girls play in the sand all day, with nothing in the world to worry about. Just relax and enjoy some good quality family time. If I were free to do anything, I would lead a life of leisure while someone else did all the chores. I would....Go to New York to see the Statue of Liberty and the Harbour fireworks show!